1) It appears that there is a synergy between Chemical Sensitivity and Electrosensitivity. 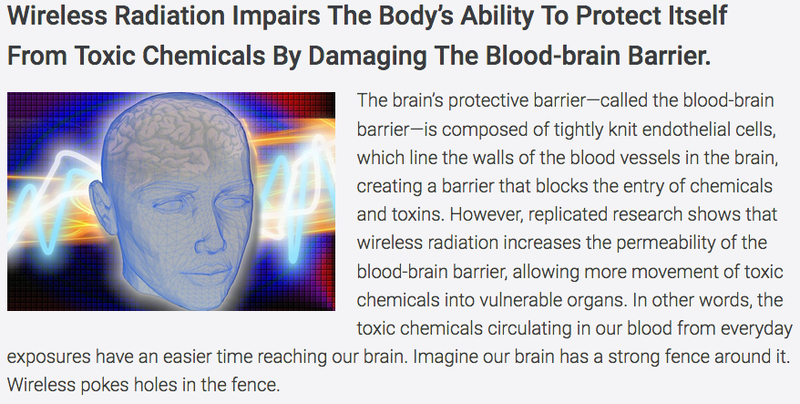 Some members who are sensitive were first exposed to chemicals like pesticides or fumes, making them more vulnerable to RF / EMF. “On March 14, 2018, University of Melbourne research revealed that 1 in 4 Americans report sensitivity to common chemicals such as inspect spray, paint, cleaning supplies, fragrances, and gas fumes. Almost ½ of this group was also medically diagnosed with Multiple Chemical Sensitivities (MCS). 2) Industry has yet to roll out milliwave technology and is already talking about using even higher frequencies, terahertz range. It will take years for research to determine if there are health effects at these new frequencies, and the government is not considering this at all when approving use of these new frequencies. “It may be too early for the wireless industry to make major investments in spectrum above 95 GHz, but it is the right time for researchers to take a closer look at the spectrum and see where it might lead. 3) Another good article from Dr. Mercola. In this one, he interviews Dr. Pall who covers a whole range of topics including how, in the USA, funding for research was cut in 1986, leaving it to the industry to mislead the public with phoney science by bent scientists (58 minute video). He explains that the current guidelines are millions of times too high to prevent harm from EMR. 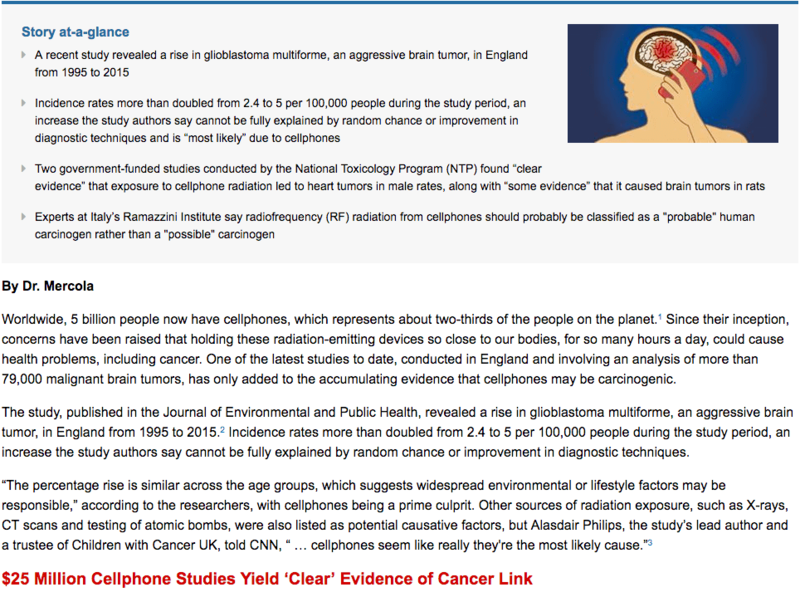 At about the 35 minute point, he speaks of a study which showed that 2 days on a cell phone caused the same damage to cells as 1600 X-rays, even though the study used continuous waves instead of pulsed waves (which are used by cell phones and are even more serious). Once activated, the VGCCs open up, allowing an abnormal influx of calcium ions into the cell, which activates nitric oxide (NO). NO is the only molecule in your body produced at high enough concentrations to outcompete other molecules for superoxide and is a precursor for peroxynitrite.14 These potent oxidant stressors are thought to be a root cause for many of today‘s chronic diseases and may be an even bigger concern than brain tumors. 4) With regard to BC Ferries, I hope many of you will give thought to how we can pressure BC Ferry Services Inc. to, at the minimum, provide a space on every ferry for those who are sensitive, who have medical implants, or who just do not want to be exposed to Wi-Fi. I know it sounds heartless to those who are sensitive but if we demand change, emphasizing those whose lives could be put at risk should their medical devices fail, everyone will benefit. The evidence can be obtained to show that interference does occur, and BC Ferries could be held liable should someone become seriously injured or worse because the Wi-Fi caused their implants or other medical devices to malfunction. We need to organize to get changes. Ideas? Willingness to organize pickets, protests, etc? Please email me at: dsnoble@shaw.ca with “BC Ferry” on the subject line. The conclusion of this review coedited by Drs. 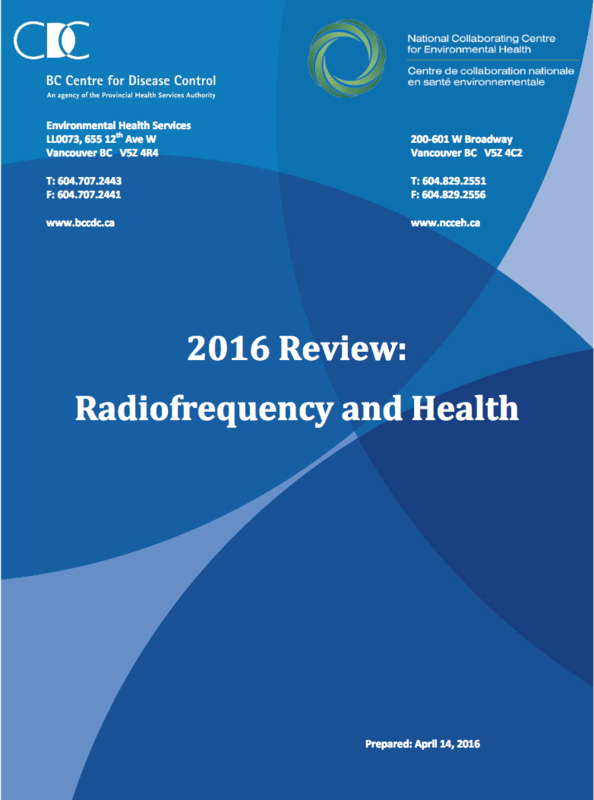 Kosatsky, Zitoni and Ward states “Carefully conducted studies on the relationship of acute and chronic health effects with measured aggregate exposures to radio frequency waves from multiple devices, particularly for children, are needed.” The 2016 report was written prior to the rapidly developing level of concern re the deployment of what the Telecom industry calls “5G”. Has the BCCDC or NCCEH studied the potential for more health concerns related to the deployment of millimeter waves into our environment? Have you considered the possibility that the radio frequency will penetrate deeper into all flora and fauna, including humans, because of the Brillouin and Sommerfeld precursors? Will the deployment of 5G technology place more people at risk of being in the near field zones, especially the near field zone around cell phones using millimeter wave technology? Are the BCCDC and NCCEH Conducting or supporting others to supply the answers to questions identified in the Review? Are the BCCDC and NCCEH monitoring the recent developments in this field? Do any of you have comments on the findings of the NTP “Report of Partial findings from the National Toxicology Program Carcinogenesis Studies of Cell Phone Radiofrequency Radiation in Hsd: Sprague Dawley SD rats (Whole Body Exposure)”, or the recent release of the Ramazzini Institute in Italy finding Schwann cell tumors in the rat hearts is consistent with a similar finding by the U.S. National Toxicology Program (NTP) in a $25 million RF project? Can the public expect a public statement on the findings of these reports soon? Is anyone in the Provincial Government or associated agency such as the BCCDC or NCCEH monitoring and keeping current on the developments in the radio frequency field? WHEN THE SLEEPER AWAKES it could be too late!